Community activist and organizer, Ralph Thornton, left a lasting legacy in Riverdale and the city of Toronto. The Ralph Thornton Community Center is a City owned, community managed facility which offers space, support, and service to many community organizations and partners. RTCC is where neighbours meet, events are celebrated, programs are enjoyed, and support is exchanged. We develop programs, nourish culture, and empower resident action. We work with other agencies, individuals, and groups to build the capacity of a caring, healthy, and vibrant community. RTCC shares the historic Post Office building at 765 Queen St. East with partner tenants the Queen/Saulter branch of Toronto Public Library and the South Riverdale Child Parent Centre. Working to ensure a more vibrant, diverse, inclusive, liveable, participatory, healthy, and equitable Riverdale. The Ralph Thornton Community Centre is a gathering place that welcomes, connects and engages the community in all its diversity. Inclusion and Respect – The RTCC supports and adheres to the City of Toronto Human Rights and Anti-Harassment Policy. We operate in a manner which models ethical, respectful, and inclusive service delivery and employment, and procurement practices, encourages diverse perspectives, and ensures equitable treatment for all. The RTCC promotes social inclusivity in all its activities and programming. Equity and Social Justice – The RTCC supports, acts, and advocates for solution-focussed policies and systemic changes that create long term improvement and fairness for all within our community and the larger society. Collaboration and Partnership – The RTCC works collaboratively and in partnership with individuals, groups, and organizations to achieve our mission and vision. We work in ways that engage community members, foster on-going relationships and build the strengths of the whole community. Capacity Building – The RTCC supports community members, especially the more marginalized, to increase their ability to solve problems, define and achieve their objectives and fully participate in and contribute to community life. Community Building – The RTCC actively promotes the building of relationships and collective action across and between our diverse communities to strengthen the whole..
Read our 2018-22 Strategic Priorities & Plan Here. The building at 765 Queen Street East was designed by E.J. (Edward James) Lennox, architect to over 70 significant buildings in the city of Toronto, including Old City Hall and Casa Loma. The building was designed in the Richardson Romanesque style which emphasizes round-headed “Romanesque” arches and cylindrical pillars with conical caps embedded in the walling. This building also features a flatbed turret clock, which must be reset by hand every week, and a handsome marble staircase. The cornerstone was officially laid on Friday, May 15, 1914. For 62 years from 1913 to 1975, 765 Queen St. E. was the home of Postal Station ‘G’. The building was designated an historical site by the Toronto Historical Board in 1973. After the post office closed in 1975, it took five years for it to become a community centre. In 1979 Toronto City Council established the South Riverdale Neighbourhood Improvement Project which recommended that the building be acquired as a multi-purpose community facility to include the Queen-Saulter Library and the South Riverdale Child Parent Centre. 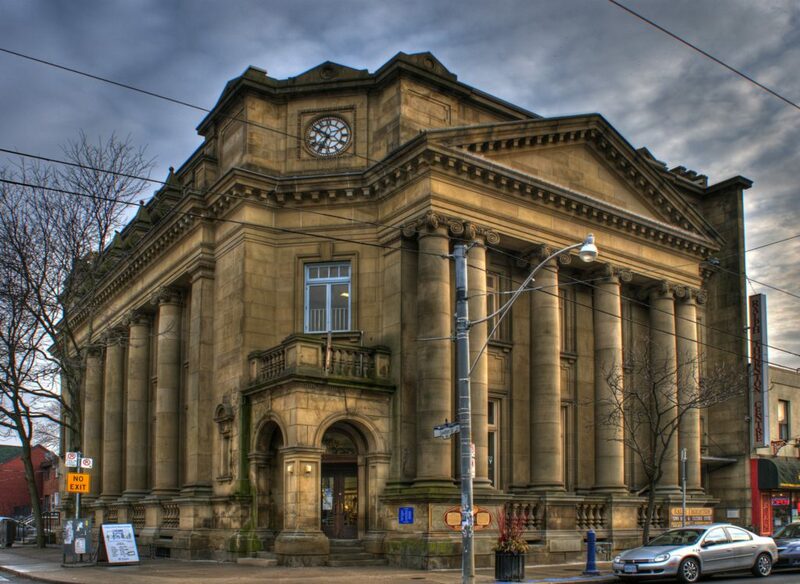 In 1980 Toronto City Council signed a 20 year lease with the federal government for the old post office and adopted a by-law establishing a community centre to be operated by a board of management elected by the community at an annual general meeting. Official opening day of the Ralph Thornton Community Centre was held on Valentine’s Day in 1981. The Centre is named for Ralph Thornton, a devoted community leader and activist, was born in Toronto in 1905 and died in September 1974 at the age of 69. For most of his working life, Ralph Thornton was an independent taxi driver. Outside of his occupation, he fought hard for working class residents around housing, income security, and city planning. 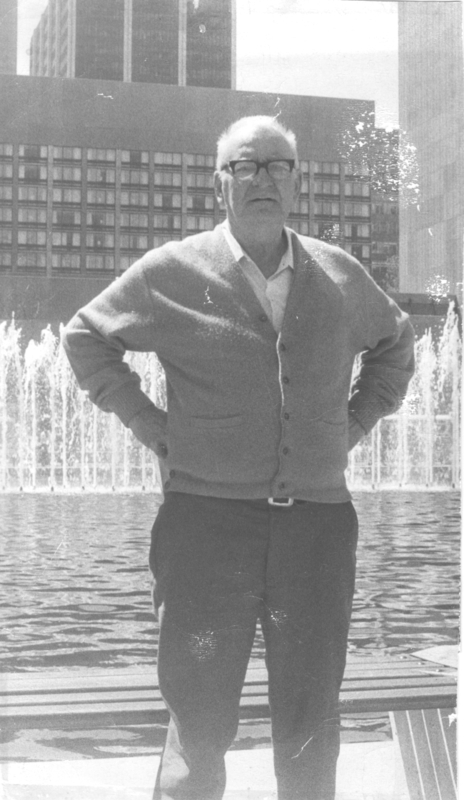 In the late 1960s, Thornton was instrumental in fighting for residents whose homes were being expropriated by the City of Toronto. His efforts led to changes in the Expropriation Act in 1968, which required the City give displaced residents enough money for their current home to purchase a comparable one.